Break-up Quotes - Quotes for You!!! 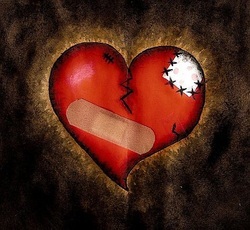 1.The heart was made to be broken. 2.A broken heart is a sign it wasnt meant to be. life with smiles and not the tears that roll. 6.I don’t miss him, I miss who I thought he was. 8.The saddest thing in the world, is loving someone who used to love you. 9.Love can sometimes be magic. But magic can sometimes… just be an illusion. 10.If someone you love hurts you cry a river, build a bridge, and get over it.